Does any member have any details about the salvage tug USS Brunswick after she was transferred to the South Korean navy in 80s/90s ? http://kalnaf.egloos.com/1589785 -This is So Korean Navy site. http://www.navsource.org/archives/09/31/3103.htm-This is US Navy site. Last edited by melliget; 30th July 2009 at 08:18.. I just came to this site because my Blog was linked here. So some people are discussing the fate of the ATS USS "Brunswick"? South Korea's ship building is currently concentrated on building huge, high-tech surface combatants, and while doing so we did not acquire enough number of auxiliary ships. That's why ROKN purchased two ATS from the USN in 1996. USS Brunswick (ATS) is now called ROKS "Gwangyang" (광양: Name of a small coastal city in Korea) (ATS 28), and is actively participating in ROKN's naval operations. Here's the picture of her, taken in 1999. I am surprised that anyone would wanna know the fate of this ship. Were you former seaman of USS Brunswick or something? We had to fix, repair, go through a total overhaul so that this huge chunk of scrap iron could become operable again, and it was a hard job. Now, she's as good as new. Thanks for your reply concerning Brunswick. I am very supprised to hear she is still operating but appreciate your comments about the building programme of the S Korean Navy. I looked at their site after getting information from another guy on this site and was impressed by the ships they have. In my later life I was closely associated with Dong Ah company in Libya for about fifteen years and made some good friends but that too was a long time ago... Time flies. Engines (per vessel): Four Paxman 12YLCM for main propulsion, each rated 1,700 bhp at 900 rpm, driving two propeller shafts through 'two into one' Modern Wheel Drive gearboxes. The Starboard pair of engines were 'standard' rotation but the Port pair 'reverse' rotation. Four Paxman 8RPHCZ Mk 5 auxiliaries, each driving a 300kWe gen-set. The gen-sets themselves were built by Paxman, with Laurence Scott and Electromotors Ltd alternators. Since being transferred to the South Korean Navy the main engines have been replaced with another make. The generators were replaced by US make. Last edited by R736476; 31st July 2009 at 11:59.. Reason: Additional info. I was part of the last crew that was on the Supertug from 1994-1996. We decomissioned her in Hawaii in the spring of 1996. Back in the spring 1994 we replaced her original with New CAT Diesel Engines. Before we decommisioned her, we had teh pleaseure of being teh first US Navy ship allowed in the waters off the coast of Cambodia for an MIA recovery off of Koh Tang Island. 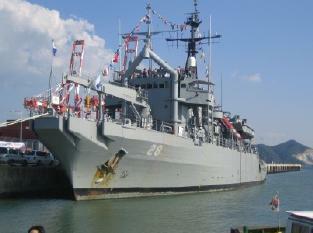 It was stationed in Sasebo, Japan and did alot of exercises with the Korean Navy/Divers. The mixed gas dive system as well as the onboard decompression chamber were several reason why the Korean Navy wanted it. name Phil balfe about 5ft 2 had long blond hair,so who aer you? Phil balfe Dover. Oh she is no moor. Last edited by philipbalfe; 10th May 2010 at 23:31.. Yes I was on her for trial runs at immingham & Lowestoft I recall as Chief Steward,think it was pulling trials (?). I did several jobs like that on new builds mostly Hall Russell shipyard Aberdeen. in early 1970s. I had already served at sea on different ships,was on Vindy training ship at Sharpness in 1946. Shortly after Brunswick got job on SENLAC of Sealink Newhaven -Dieppe run. Finally left the sea in 1977 after thirty years. Went on N>Sea oil for a while then Saudi Arabia for five years followed by Libya 15 years and was there till I retired at 65 in 1996. Moved to France permanently in 1993.Just got back from Saudi again Riyadh visiting my younger son who works there, lots of changes there nowadays. Must be getting old,,,,, 79 and feeling it. I'm not surprised that USN 'ditched' the Paxmans, B. awful engines. The best one I ever saw was the remains of one that 'accidentally' fell over-board in the Tasman Sea. Oh we did cheer, but fully expected Davy Jones to send it back. Find all posts by Abbeywood.